The global trade in roundwood, paper, furniture, and other products originating from illegally extracted timber is a multi-million dollar industry. Illegal logging and related trade occurs when timber is harvested, transported, processed, bought or sold in violation of national or sub-national laws. It can also happen when forests are cleared for plantations such as oil palm. Illegal logging exists because of increasing demand for timber, paper and derivative products, including packaging. Illegal logging not only leaves an obvious mark of destruction on forests – gaping holes where ancient trees once stood – it strips the economic livelihood of local communities and responsible companies. There’s also another cost – lost revenue that may have been generated from legal logging of forests. When trees are cut without the right permits and are smuggled abroad, governments lose out financially in several ways, including lost revenue from taxes and duties and the costs of efforts to manage illegal logging. Timber that is logged without payment of duties and taxes pushes down the market price of timber, which acts as an incentive for other loggers to follow the same practice. This further increases losses to governments and starts a vicious cycle in the market. A study by the American Forest & Paper Association has estimated that illegal logging depresses world timber prices by between 7% and 16%, depending on the product. This causes US firms losses of at least US$460 million each year. The World Bank states that the annual global market loses US$10 billion annually from illegal logging, with governments losing an additional US$5 billion in revenues. Illegal logging threatens some of the world's most valuable forests – from the Amazon to the Russian Far East. And yet, for many of the people that live in these forests, illegal logging is a vital source of income – sometimes it is the only way to survive. But at other times it threatens their livelihood. Increased demand for forests products has brought some financial benefits for poor people living in or near forests. But there is also evidence to show that usually, poor communities who are completely dependent on forests lose out to powerful interests, logging companies and migrant workers who reap most of the benefits. How does this happen? 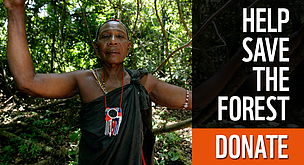 Around the world, many forest-dwelling communities have little control over ownership of their land. This makes them vulnerable to outsiders who try to gain access to their forest, which may cause repression and human rights violations. Or just plain exploitation. Chatham House Report - Tackling illegal logging and the related trade: what progress and where next? 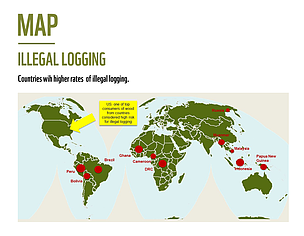 Illegal logging accounts for 50-90% of all forestry activities in key producer tropical forests, such as those of the Amazon Basin, Central Africa and Southeast Asia, and 15-30% of all wood traded globally*. trade in illegally harvested timber is highly lucrative and estimated to be worth between USD $30 and USD $100 billion annually*. in wood products is helping reduce illegal logging, but it continues to undermine legal trade and much more needs to be done to halt it. 40-61% of timber production in Indonesia is believed to stem from illegal logging. 25% of Russia's timber exports originate from illegal logging. In Gabon, 70% of harvested timber is considered illegal. Forest stewardship, motivated by a commercial interest in maintaining wood supply, can help protect vulnerable forests from illegal logging, encroachment or conversion to farmland. That's why it's critical to work closely with the timber industry to ensure they not only meet legal requirements, but take a step beyond to practice responsible forest management and trade. The Global Forest & Trade Network (GFTN), created in 1999, is one of WWF's leading initiatives to combat illegal logging and drive improvements in the forest products sector. GFTN helps its participants overcome forest management and responsible purchasing challenges while progressing towards credible certification. As part of this effort, WWF promotes forest certification through the Forest Stewardship Council (FSC). Find out more about the GFTN’s work in advancing sustainable forestry.